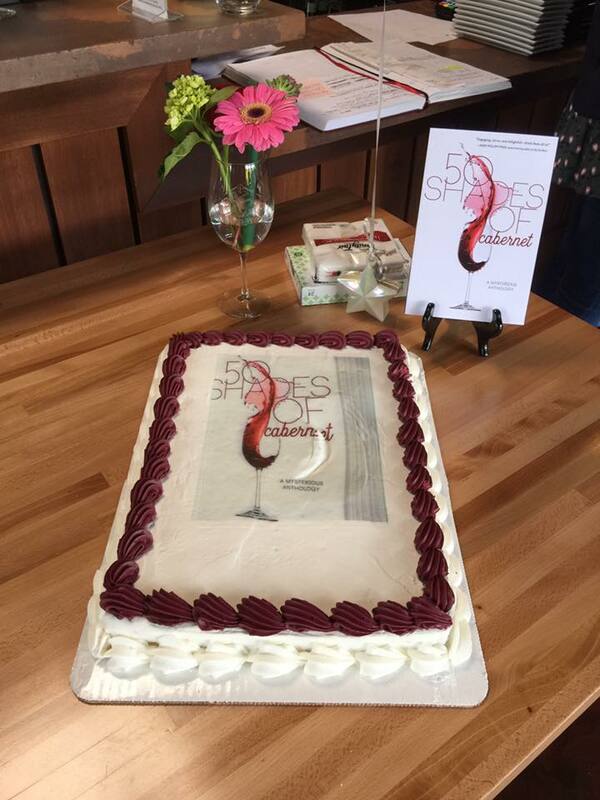 Yesterday, we had a book signing for 50 Shades of Cabernet at the Mermaid Winery in Norfolk. It's billed as Virginia's urban winery. This is such a great place. I grew up in Tidewater, and I hardly recognized W 22nd Street. The city is alive with so many neat places, and the Mermaid Winery is definitely a place you need to check out. The food, atmosphere, and staff were wonderful. Okay, I'm a wine novice, so I'm learning a lot on this wine/book tour. The Mermaid Winery has metal glass holders for those doing tastings. I loved the tree of wine glasses. The staff set up a wine tasting for our book launch. I spotted a glass with a pretty shade of red at the bar. I asked the wine steward about that particular wine, and she replied, "That's the dump cup." I've still got a lot to learn. I am fortunate to be a part of a new wine-themed mystery anthology, 50 Shades of Cabernet with some talented authors: Barb Goffman, Teresa Inge, Kristin Kisska, Jayne Ormerod, Maria Hudgins, Lyn Brittan, Douglas Lutz, Alan Orloff, Debbiann Holmes, Betsy Ashton, James M. Jackson, Tina Whittle, Maggie King, Nancy Naigle, Rosemary Shomaker, Jenny Sparks, and Ken Wingate. As part of the book promotion, we're visiting wineries, wine shops, and festivals up and down the east coast. Here's my disclaimer: I am a wine novice. I prefer iced tea and Dr. Pepper, so I've got a lot to learn. In college, we drank wine out of cardboard boxes, and I tend to pick vintages by the label design or the name. I'm hoping I'll learn more this spring and summer about vintages, grapes, and styles. Last weekend, we attended the Farmville Wine Festival, a fundraiser for Meals on Wheels, in downtown Farmville, Virginia. The weather and the band were great, and our mystery anthology pairedwell with all the wines. It was a lot of fun to meet wine lovers and mystery fans. We quickly spotted the wine festival pros at the event. They sported a variety of wine glass slings or necklaces. One lady explained to me that a good one should be able to accommodate a stemmed or a stemless tasting glass. Many of the slings/necklaces were utilitarian, while others were personalized with sayings and sequins. I had never seen one of these before. I'm going to have to find one for mystery writers. We also had the pleasure of meeting Christopher Brochon from WFLO in Farmville. He was a wealth of information about wines and flavors. I appreciate all of his insights. The booth next to us offered tomato and pumpkin wines. I didn't have time to stop for a tasting, but I was curious about the tomato one. Our next stop will be the Mermaid Winery in Norfolk, Virginia in May, and I'm looking forward to the next adventure.